The first time I heard this was in "Alice's Restaurant". I tried to describe this scene to my wife last night; the new grave, red roses thrown to the lowered casket while snow flurries caressed the mourners, but even after 40 years I became too choked up to speak. I LOVE this song! Love the lyrics, the vocals/harmonies, the guitar work... WOW! I'm a songwriter and I'm continuously searching for real music in various styles and places for inspiration. This song is one of my latest discoveries but I feel like I've always known this song by heart. This song is a timeless masterpiece and it speaks directly to our soul. 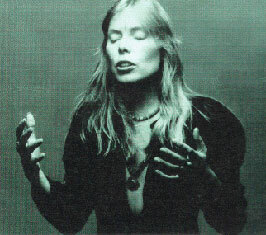 I wish I could pour melodies of my heart into a song as well as Joni Mitchell can. There are no words any more, at least for me, to describe this song's beauty... there's "so much said in listening".